Jupiter is the largest of the planets. It is the 5th planet out from our "Sun". It's equatorial diameter is 89,400 miles. That is 11 times the diameter of the Earth. It's polar diameter is about 6,000 miles shorter. This is an equilibrium condition resulting from the liquidity of the planet and it's extremely rapid rate of rotation. A day on Jupiter is only 10 Earth hours long. Jupiter moves, at a point on it's equator, with a calculated speed of 22,000 miles an hour, as compared with Earth's equatorial speed of 1,000 miles an hour. For a planet this size, it's speed is amazing. Jupiter is at an average distance of 483.6 million miles from the "Sun". It takes Jupiter 12 of our Earth years to complete it's circuit around the Sun. It is a gaseous planet with an atmosphere of hydrogen and helium, with traces of methane, ammonia and other gases. Jupiter has five or six storm zones, each comprised of eastward and westward counter flowing winds. The temperatures at the tops of the clouds are believed to be at minus 300 0 F. The clouds are probably ammonia ice crystals, becoming ammonia droplets lower down. The total atmosphere may be only a few hundred miles in depth, being pulled down by the tremendous surface gravity of 2.64 times Earth's gravity, into a relatively thin layer. 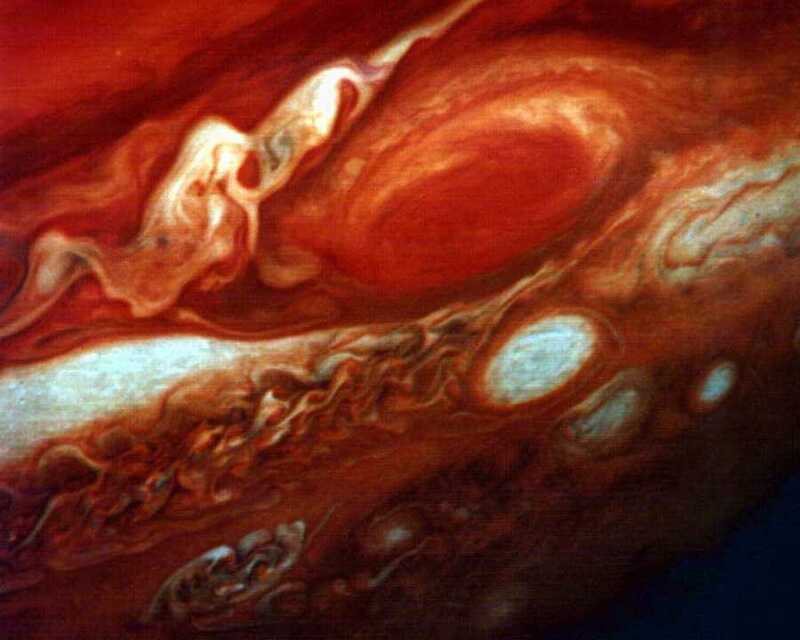 "Pioneers" 10 and 11 sent back evidence for considering Jupiter to be almost entirely liquid hydrogen. It has been speculated that long before a rocky core is reached, that the liquid hydrogen mixed with helium, would become a liquid metal, at very high temperatures and pressures. The cloudy atmosphere is a good reflector of sunlight and at times causes Jupiter to appear far brighter than any star. Jupiter has as many as 39 known satellites classified as moons, of which 31 are known as irregulars. Some satellites are as small as one to two miles in diameter. Four of the moons are large and bright, about the same size of our own moon or the "Planet Mercury" in diameter. The other 35 moons are much smaller in size and 20 of them are much farther away from Jupiter, some 14 million miles, in their orbits. Jupiter's mass is more than twice the mass of all the other planets put together, and accounts for Jupiter's tremendous gravitational pull, along with the numerous satellites and the density of it's atmosphere. Four U.S. Space Probes have encountered the Jovian System. 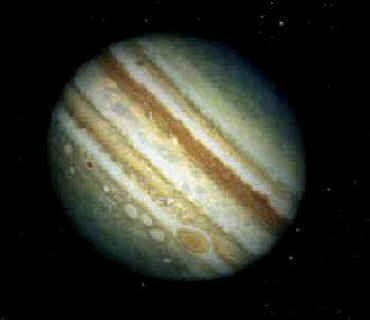 In December of 1973, "Pioneer" 10 passed within 80,000 miles of Jupiter's equator, and was whipped by Jupiter's gravitational pull into an alternate trajectory, taking it out of our solar system and beyond our system of planets, on June 13th, 1983. In December of 1974 "Pioneer" 11 passed within 30,000 miles of Jupiter, moving from south to north over the poles. Photographs that were taken were useful but were far surpassed by those taken by "Voyagers" I and II. The moons of Jupiter were photographed in great detail. "The Great Red Spot" on Jupiter's surface, exhibits an internal counterclockwise rotation. The cyclonic storm measures 30,000 miles long by 10,000 miles wide. 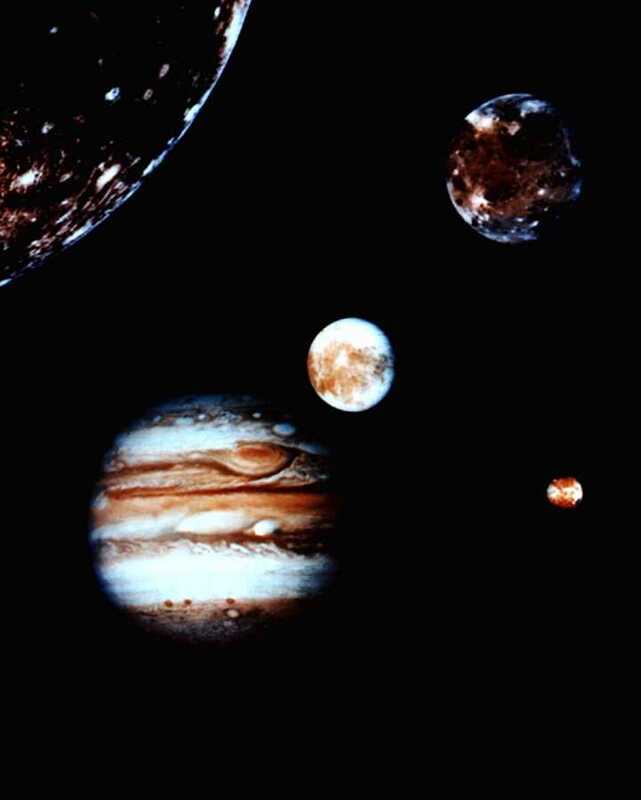 The 4 largest moons of Jupiter were discovered by "Galileo" in the year 1610. 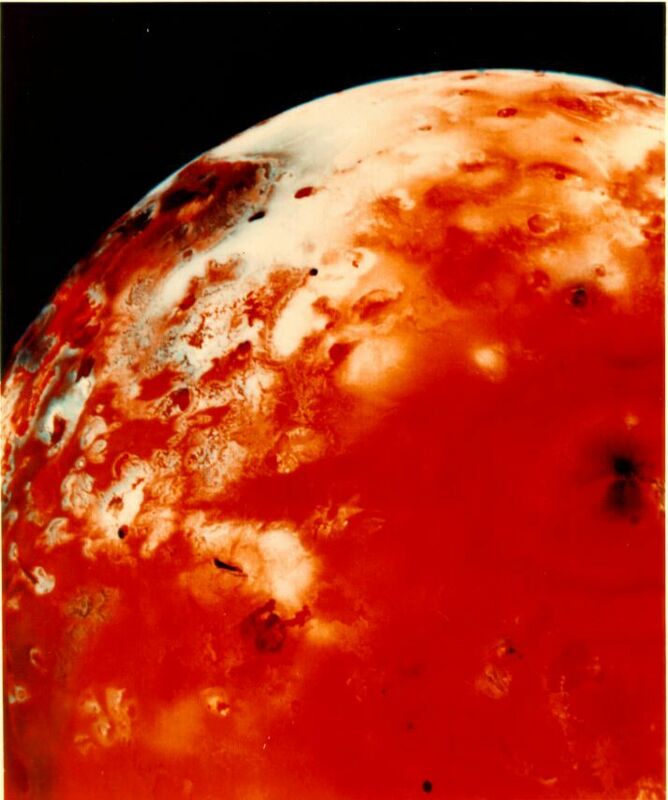 "Io", the closest of the four, is 2,257 miles in diameter and is the most geologically active, with eight active volcanoes, that are probably energized by the tidal effects of Jupiter's enormous mass. "Io's" volcanoes have ejected material into a doughnut shaped ring enveloping it's orbit around Jupiter. 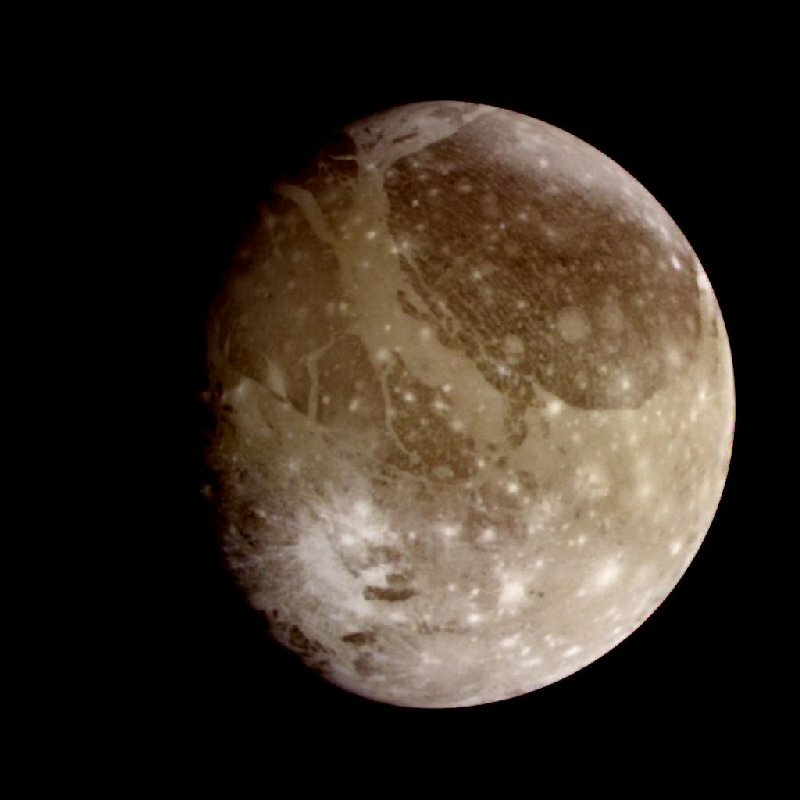 "Ganymede", is the second most distant of the four, and is 3,279 miles in diameter. It is the largest moon in our solar system, with heavily cratered regions, some measuring 10 miles across. 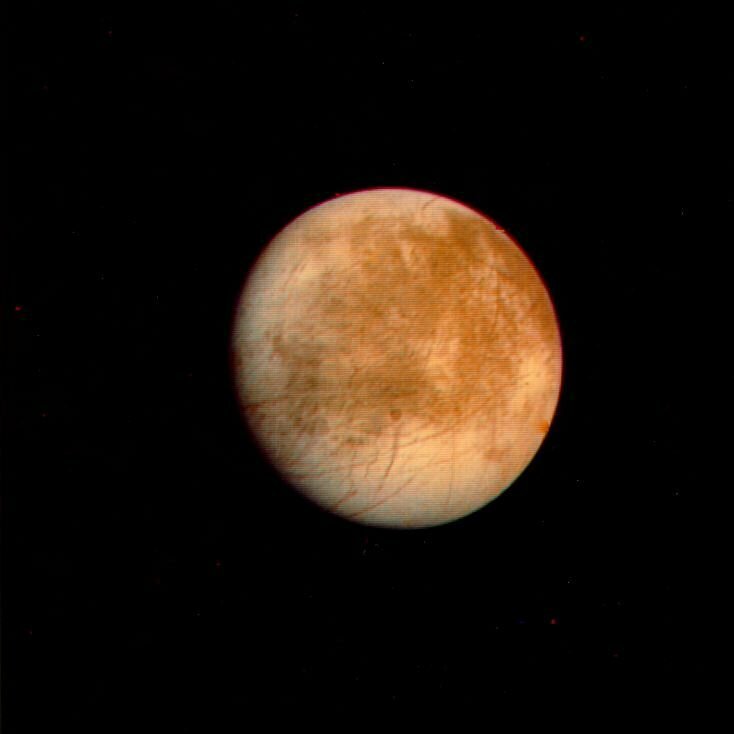 "Europa" is a white, highly reflective body measuring 1,942 miles in diameter. It has a smooth surface covered with dark streaks that are some 35 miles wide and hundreds of miles long. "Callisto", the most distant of the four, has an estimated diameter of 2,995 miles. 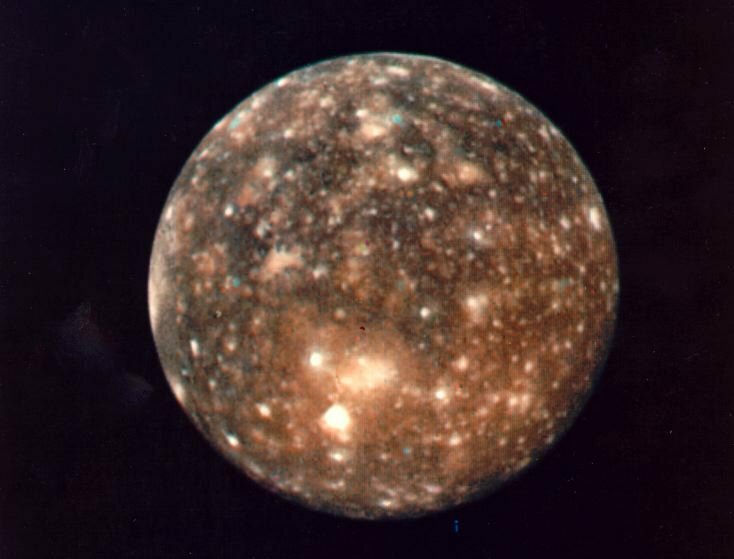 Callisto also, has a heavily cratered surface. There is a fifth satellite, known as "Amalthea", which is red in color. The small, elongated moon is interior to "Io's" orbit and is estimated to be about 150 miles in diameter. It was discovered in 1892 by Edward Barnard.